Handbank Texels shearling rams in Yorkshire. The Handbank flock of pedigree Texels concentrate on producing Signet recorded shearling rams and ram lambs which are birth-notified annually with the Texel Sheep Society.We became interested in recording about 20 years ago when we heard commercial farmers at ram sales in local markets sharing doubts about some rams being too "pumped up" with corn. They often added that they would "melt" if they took them back home to their own farms. 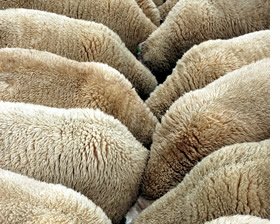 We know that there are wide differences in performance within any group of sheep, and also that most (if not all) pedigree breeders give corn to their sheep. Nevertheless it seemed important also to remember that most sheep will need to finish on grass so it was essential to find out which sheep showed good growth rates and muscle depths, regardless of being fed corn. Over the years, we have seen convincing evidence that the use of recording is a reliable tool for predicting how a ram's progeny is likely to perform, as we have seen again and again that where the parents have good growth rates, good muscle depths or smaller back-fat coverings they are more likely to pass on these features to their lambs. Despite our commitment to recording, it has not been at the expense of all other factors. We have always recognised that it is important for stock to be correct and have good conformation, and to bear in mind the end product. Acknowledgement: We are grateful to Kath Birkinshaw (see Links) for some of the images posted on this web-site.